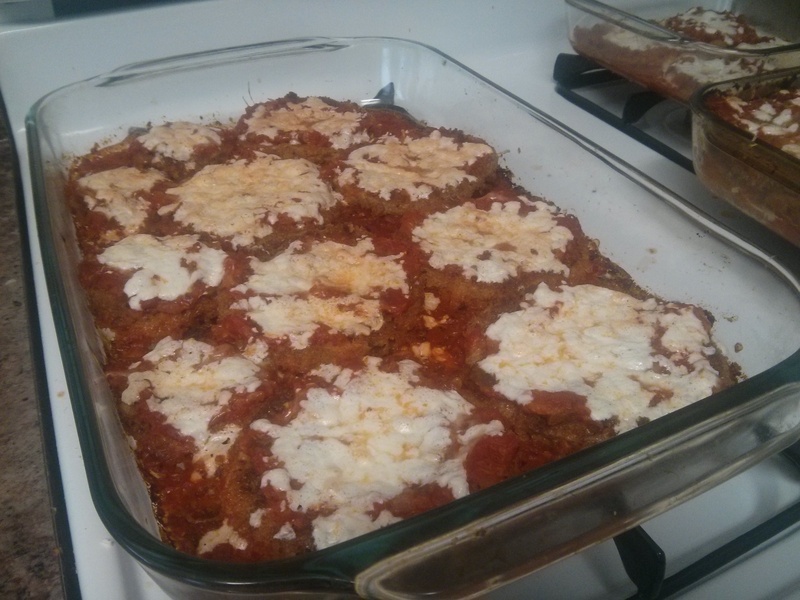 And then, there was Eggplant Parmesan. 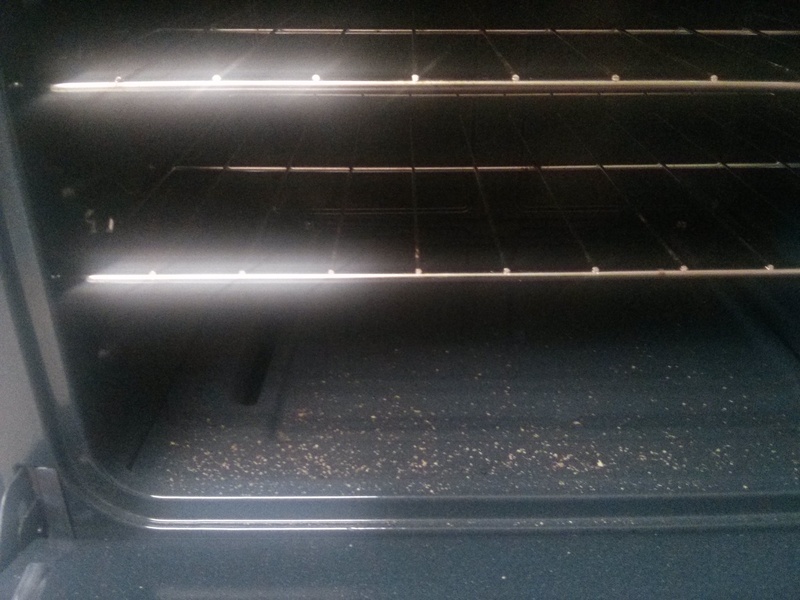 If you’re like me and made fresh bread crumbs for the eggplant, the first step is, Clean out the oven. 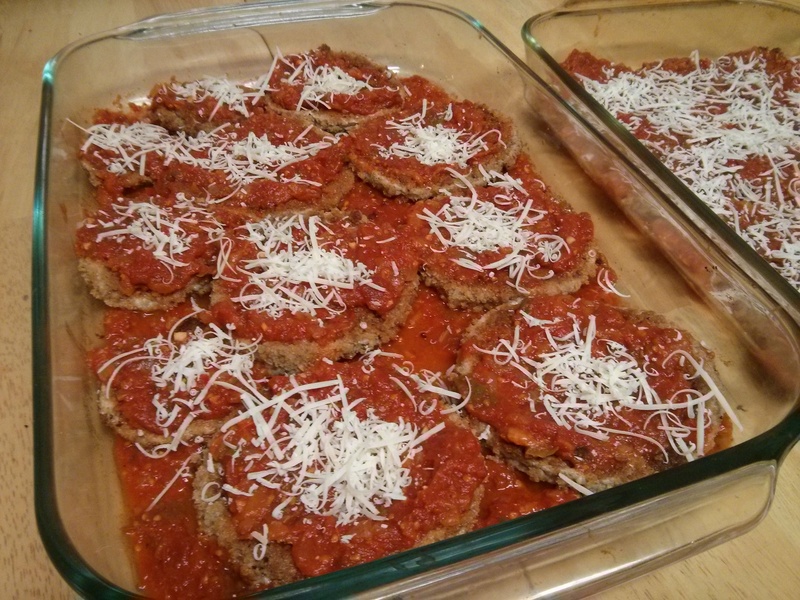 I mentioned earlier that I had already made Eggplant Parmesan about three times this year. 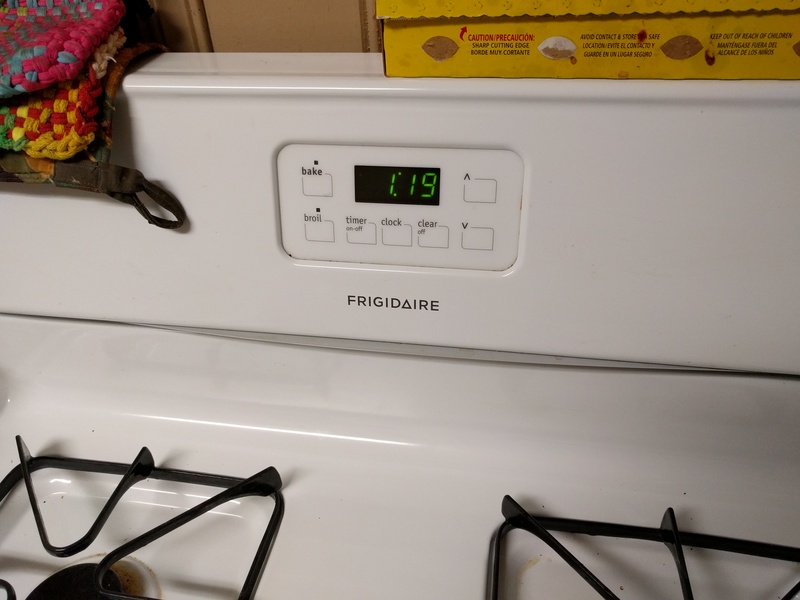 I’ll mention now that two of those times, I started preheating the oven for the eggplant before I remembered to clean up the bread pieces. The smell of something burning, in these cases, provided a good reminder of this step. The next step is getring the baking dishes ready. This means adding a small layer of tomato sauce to each dish. If you’re making individual Eggplant Parmesan pieces, this is particularly important so the areas around the pieces don’t burn. Now add all the ingredients, one after another, to form the Eggplant Parmesan pieces – the eggplant, tomato sauce, Parmesan cheese, and then the mozzarella cheese. The process for the layered version is basically the same – just repeat the same ingredient-steps to create however many layers you want. In terms of the cheese to be added, I shredded the Parmesan fine and the mozzarella regular-size. To the right in the pictures above is a second dish where I did the layered version. 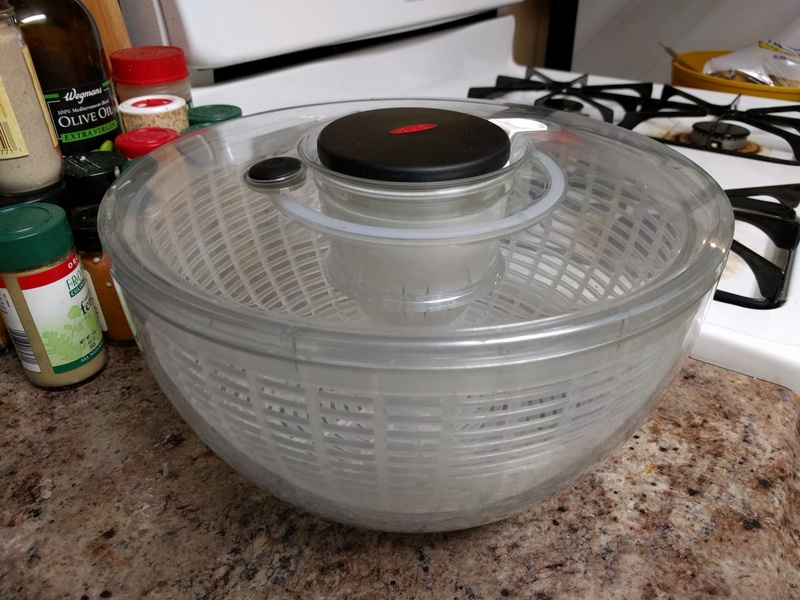 Three layers were a good fit for this standard 9″ x 13″ x 2″ glass baking dish and for the amount of eggplant I had prepared. 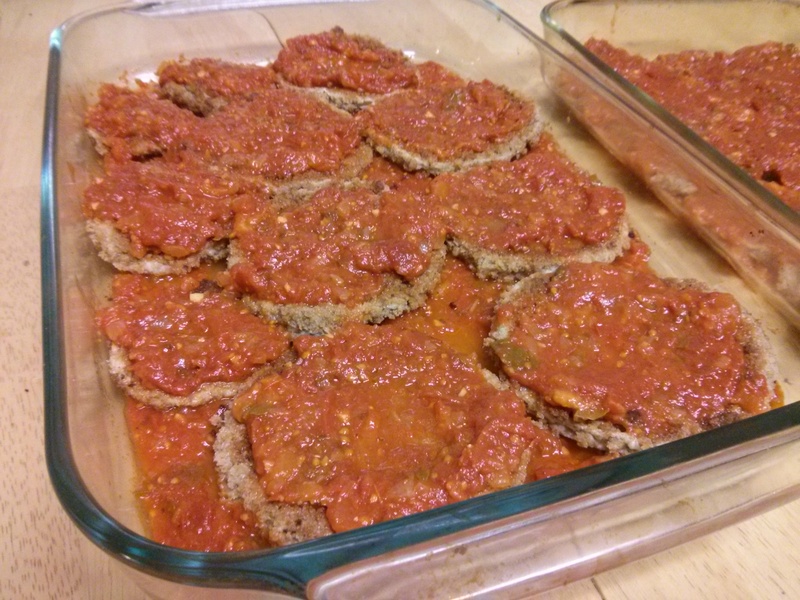 When making the layers, I packed the eggplant pieces a little more tightly so there weren’t many gaps. 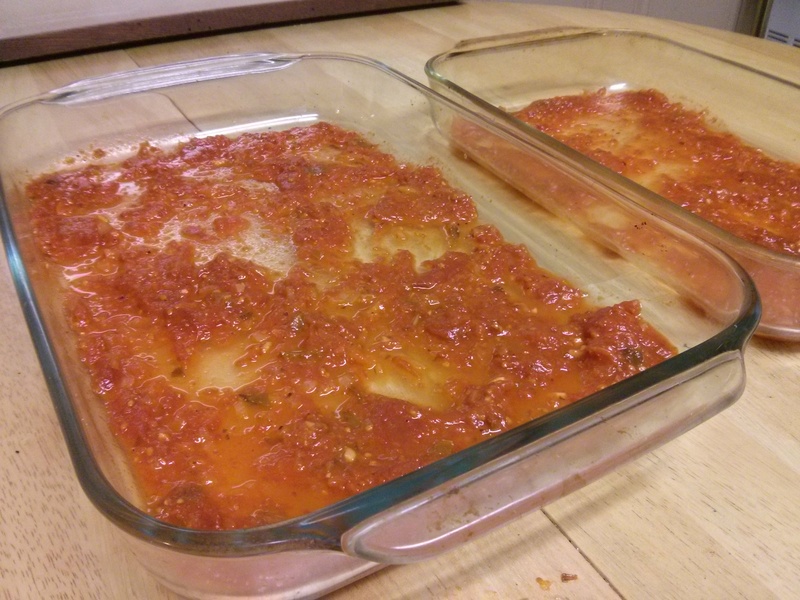 Then following in turn, I added enough tomato sauce to make the sauce uniform on top of that. 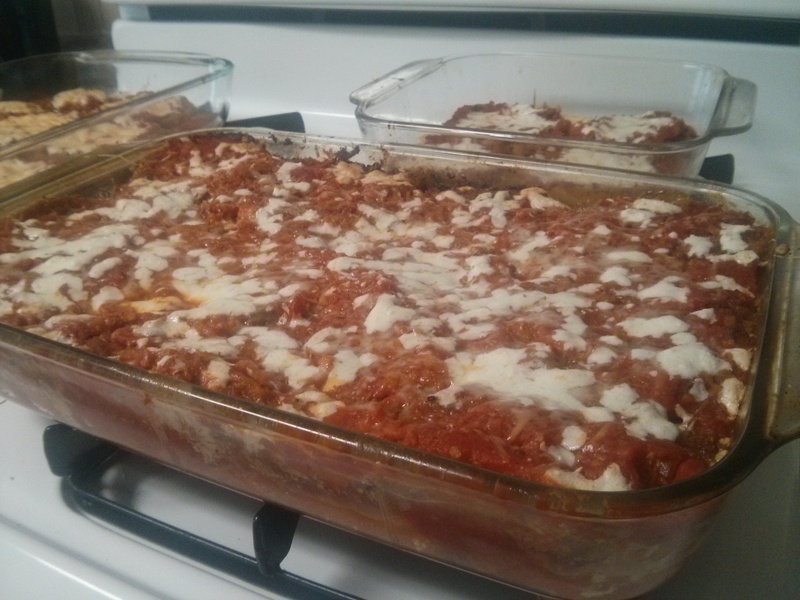 Then the cheeses are added, spread evenly on top of the sauce, and the layer’s done. 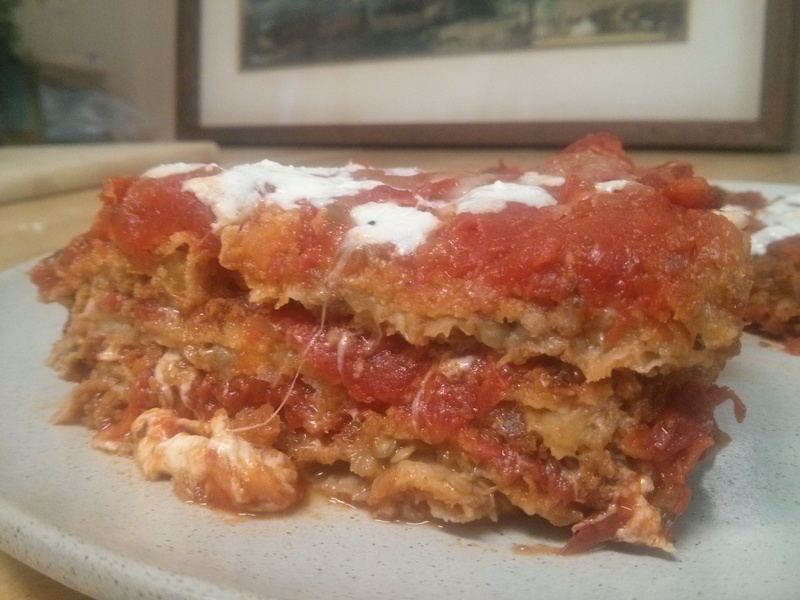 Each of the three layers was the same: eggplant, tomato sauce, and then the Parmesan and mozzarella. With the Eggplant Parmesan pieces and/or layers now ready, preheat the oven to 350 degrees, and bake until the sauce starts to bubble and the cheese all melts together (and begins to crisp just slightly). This took me 25 minutes baking at 350 (and then 5 minutes more at 400 to get the desired crisp). Maybe better would have been 20 minutes at 375 – something to try next time. Of course, you can also do everything on one day. It’s really only the two middle steps, the eggplant and the sauce, that take some time. 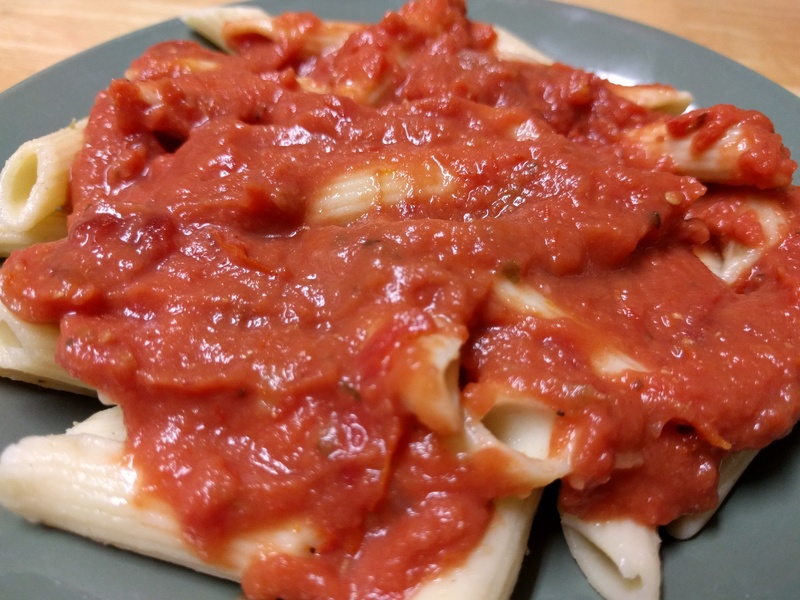 There are also ways to make the sauce more quickly, like simmering it for less time (or using canned tomatoes instead of fresh). If you try making it, let me know how it turns out. I bet it’ll be good. 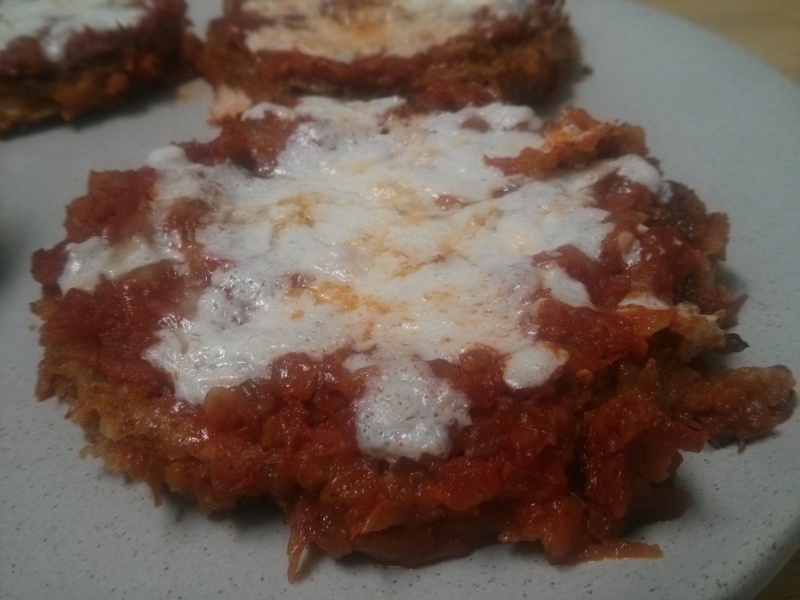 For me, eating some warm, freshly-made Eggplant Parmesan is a melts-in-your-mouth experience that often makes me think, and sometimes say out loud, Wow, this is good. 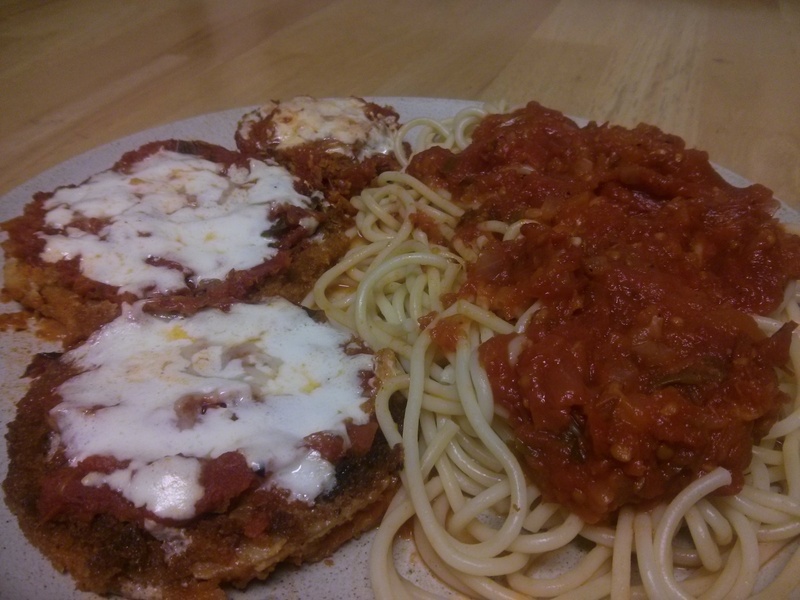 This entry was posted in Uncategorized and tagged eggplant parmesan, food, fried eggplant, mozzarella cheese, Parmesan cheese, tomato sauce, vegetarian on October 17, 2014 by dave379. So how much sauce can you make from this many tomatoes? Let’s find out! And take a look at some pictures. 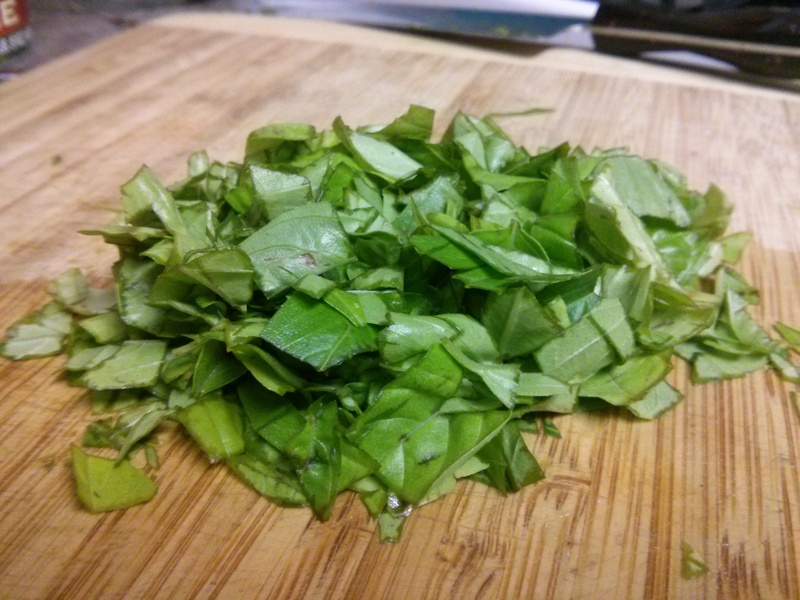 So the recipe, as you may know, actually appears in the previous post. I enjoyed writing it, and it pretty much covers the important things. I think part of the art is making it your own – figuring out what you like and also improvising – and for me and tomato sauce, I often just take whatever I have on hand and go from there. The recipe is the process. Among the many things I like about cooking, one is that that no matter what you do, it usually turns out alright in the end. And if something doesn’t work out, that’s okay too. 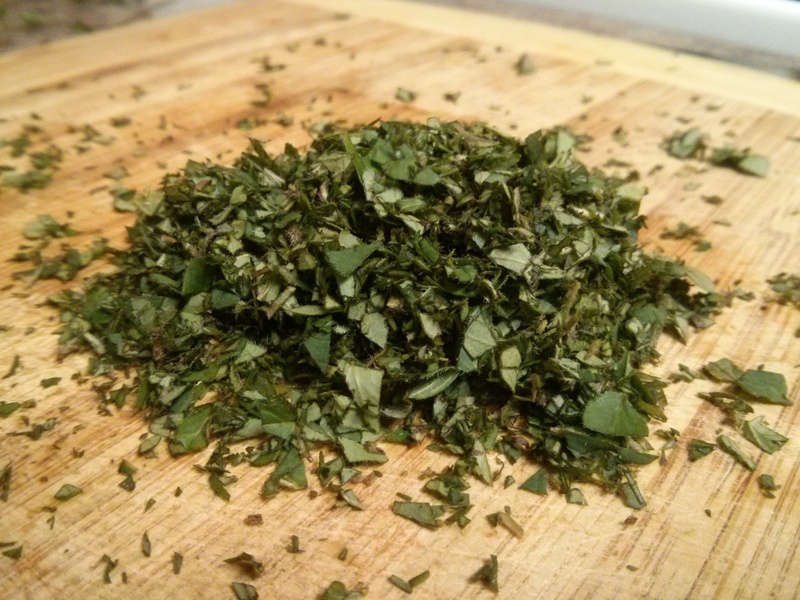 Only have dried oregano instead fresh, or no oregano at all? It’s still going to be good. Or decide to let it simmer for an extra hour, on purpose or by accident? Still going to taste good. Or want to try a mix of yellow and red tomatoes? It’s going to look and taste good. The first step is cutting the stems out of the large tomatoes. 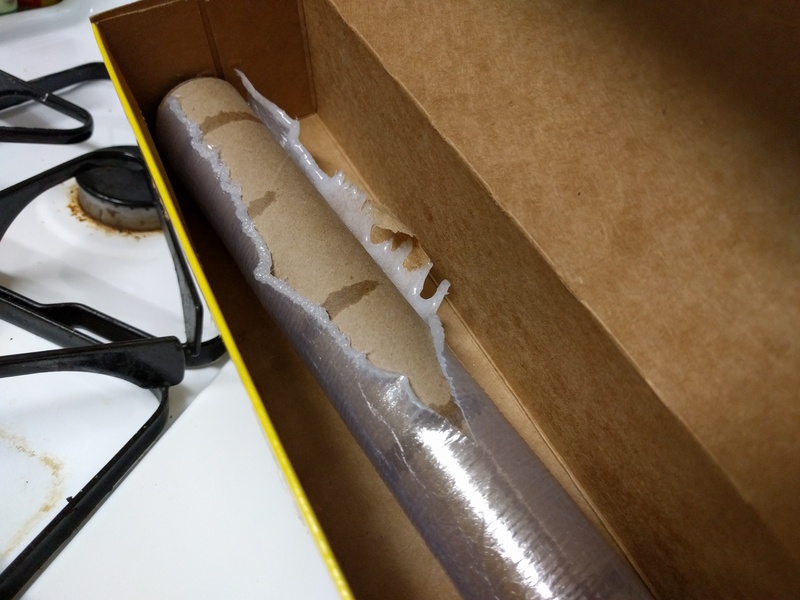 This makes it easier to peel and save the skins later on (after step 2). Because the stems on the plum tomatoes and smaller tomatoes are so small, they’re fine to stay in. The next step is boiling a pot of water and putting the tomatoes in. The purpose here is to crack and loosen the skins and to partially cook and soften the tomatoes. Some recipes say to leave the tomatoes in for just a minute or two, to only work the skins (in which case more of the tomato-cooking/simmering will happen later), but I’ve been leaving them in longer, sometimes 15-30 minutes, meaning I’ll do some of the initial cooking during this initial step. This also makes it easier to break the tomatoes into smaller pieces later. 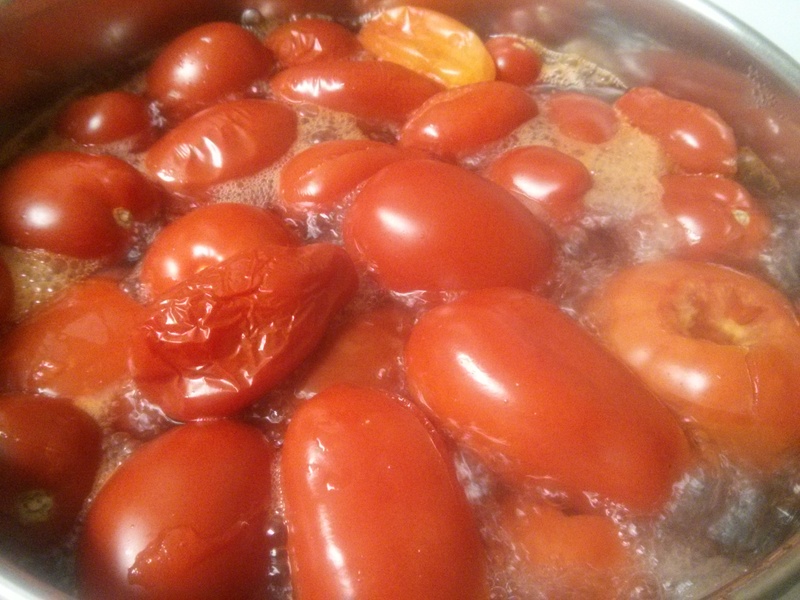 I take the tomatoes out of the boiling water when they’re half or more soft, but can still hold their shape. If the tomatoes are at different stages of ripeness and if some are large and some are small, they’ll be ready to be taken out at different times. How about those cracked skins? 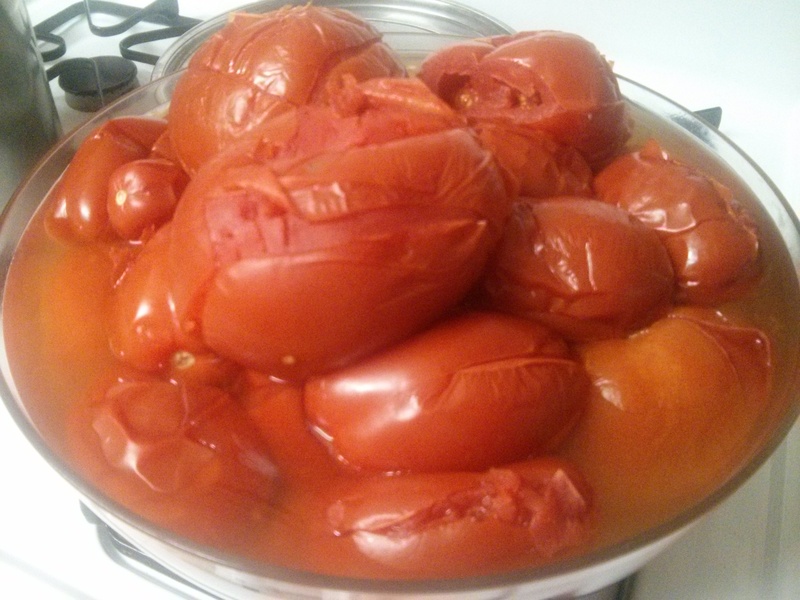 This is how the tomatoes looked after their hot water bath. When I measured the volume of this bowl later using water, I found that the bowl holds 160 oz. That’s ten pounds! That’s also the equivalent, in terms of 28-oz cans of crushed tomatoes, of more than 5 1/2 such cans. 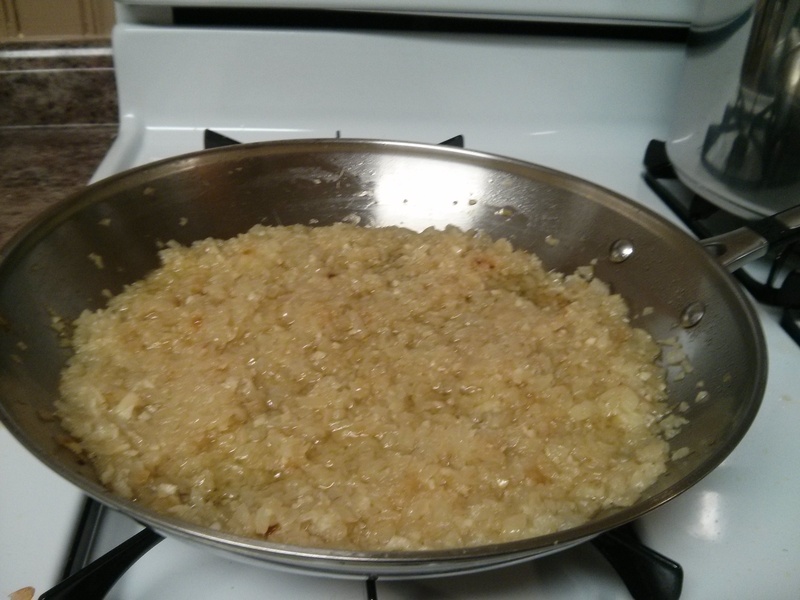 The next step is prepping the onions and garlic for the sauce. 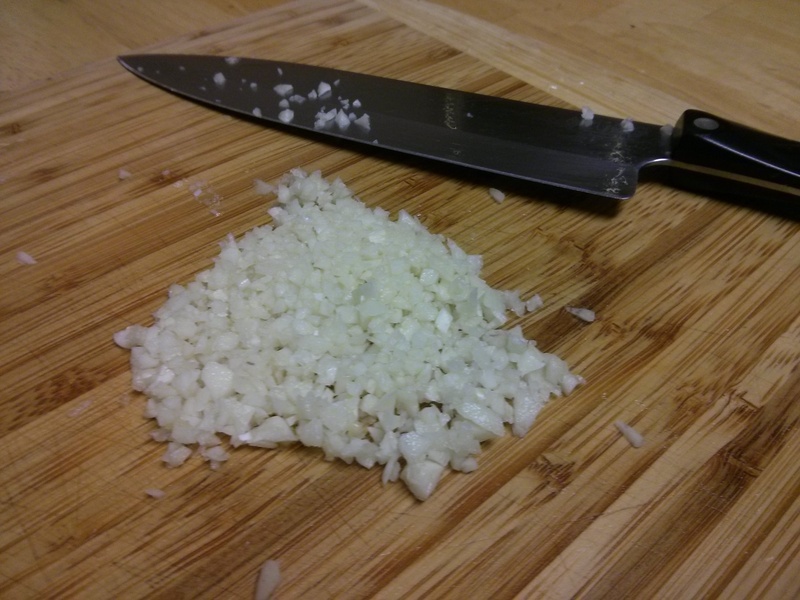 This means dicing and sautéing them in olive oil until they’re soft. 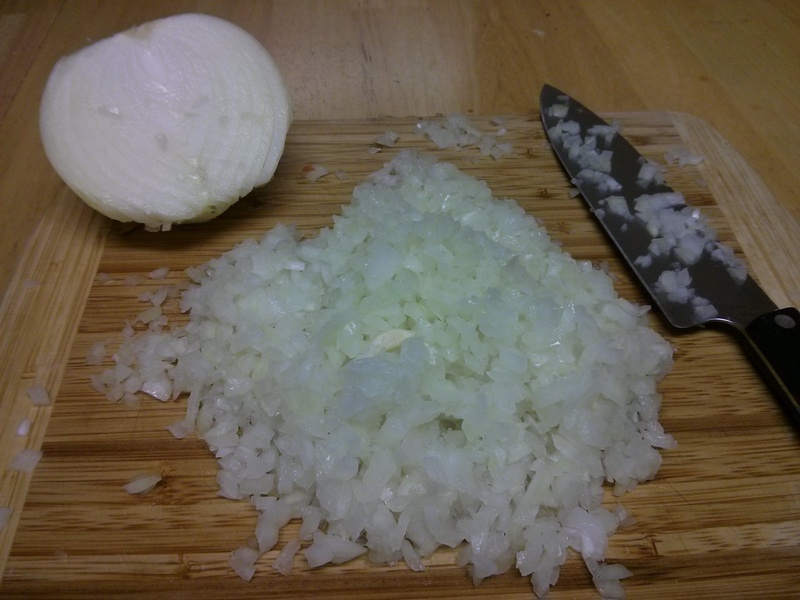 I used two large onions and three cloves of garlic this time. For the oil, I started with 1/2 cup, which might sound like a lot, but there was also a lot of tomatoes, and the olive oil helps to make for a richer sauce. 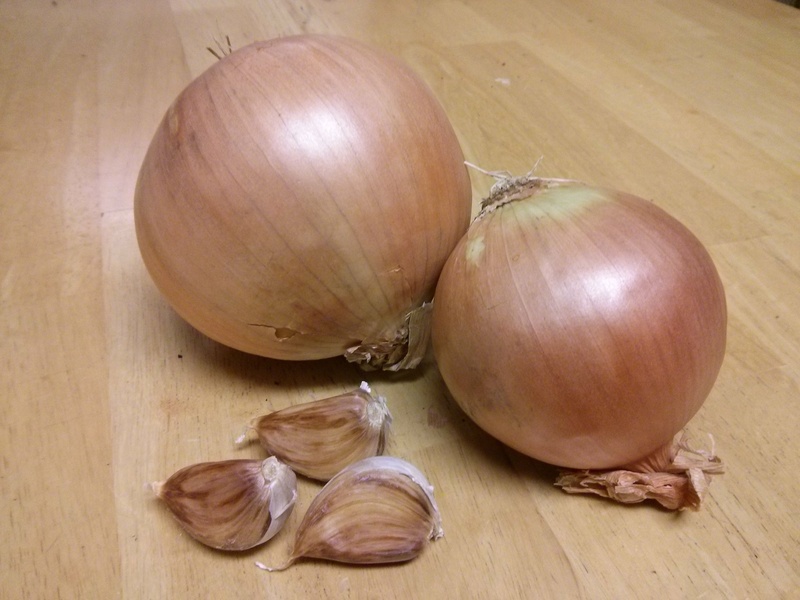 If I were making a smaller batch of sauce, I might start with one onion and one garlic clove. After the onions and garlic are ready, transfer them to a large pot and add the tomatoes (after first having removed the tomatoes’ skins). 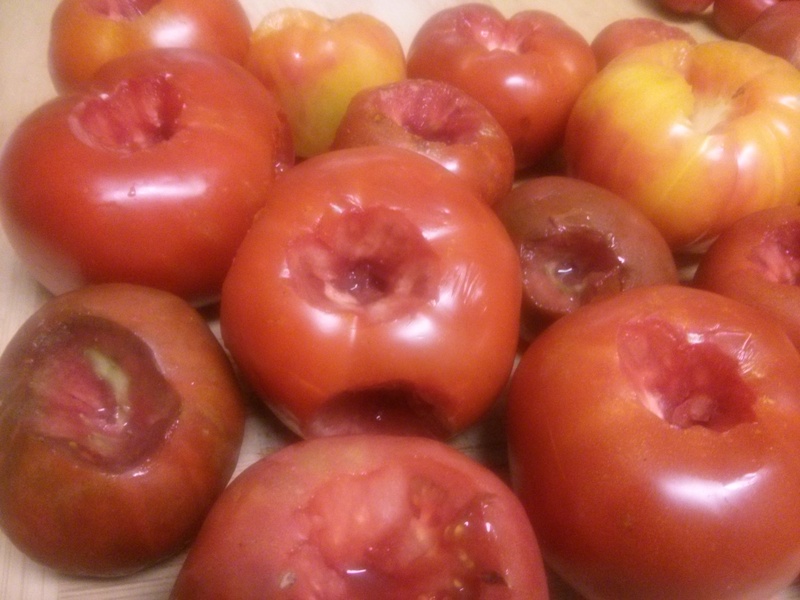 Some recipes also say to remove the tomatoes’ seeds, but the seeds don’t bother me so I’ve never done that. 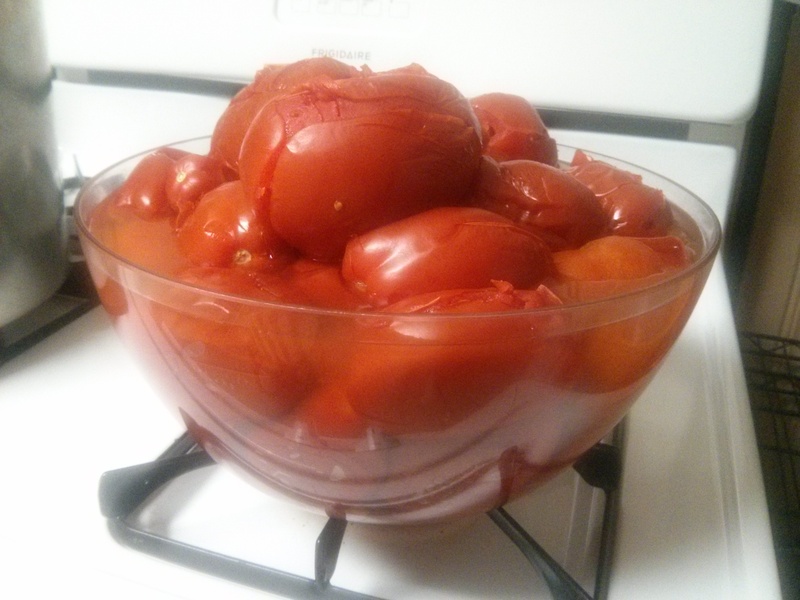 With the tomatoes now in the pot, at this point you can also break the them into smaller pieces using a wooden spoon, potato masher, or other kitchen implement that is up to the task. 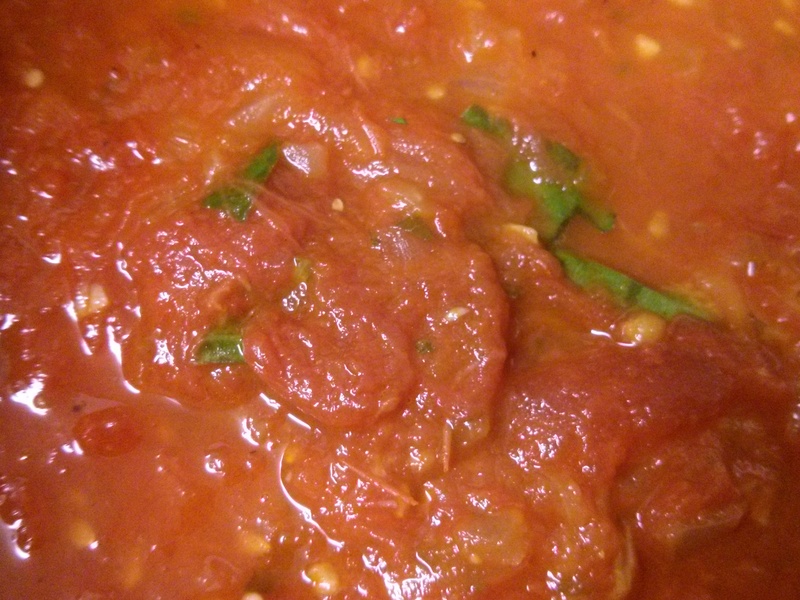 The tomato sauce can then be left to simmer while finishing the rest of the recipe. 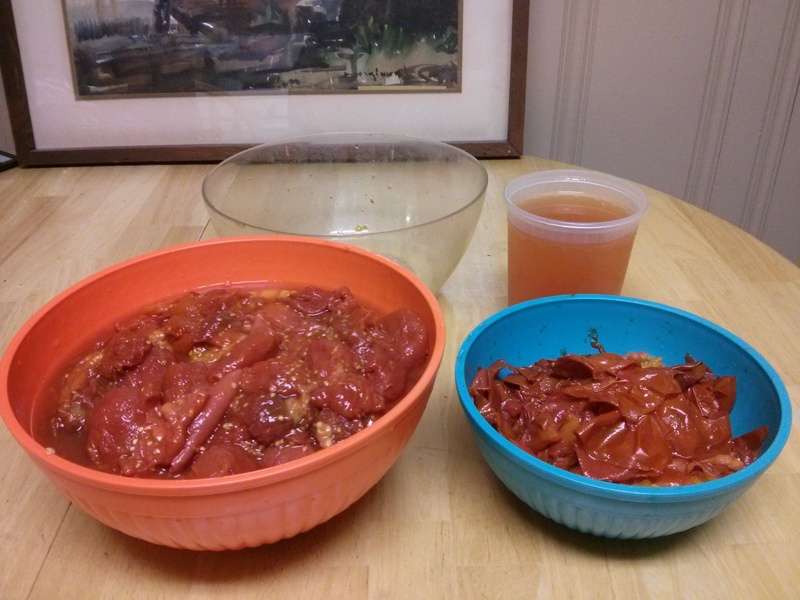 Above is how the tomatoes looked (L) after removing the skins (R). 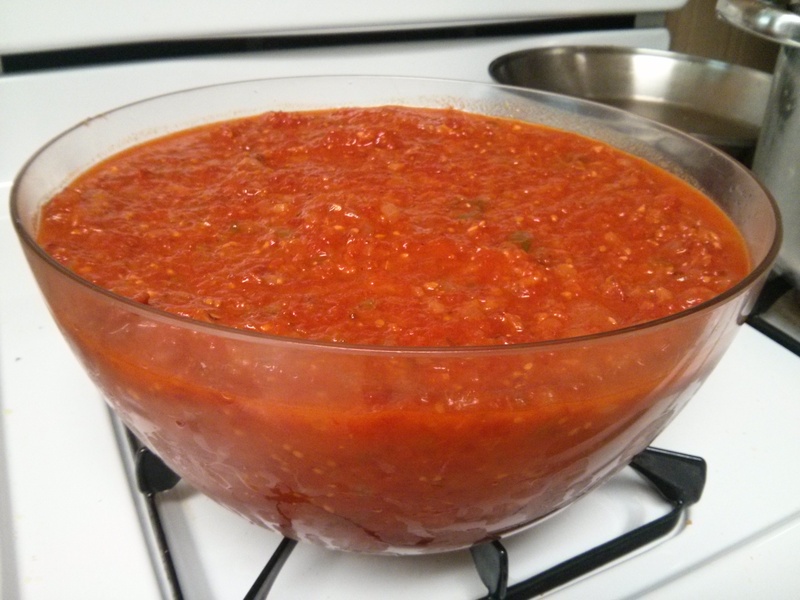 I also poured out (and saved for another day) the extra tomato liquid so that the future sauce would be thicker. In this case, the extra liquid amounted to a full 32 oz. 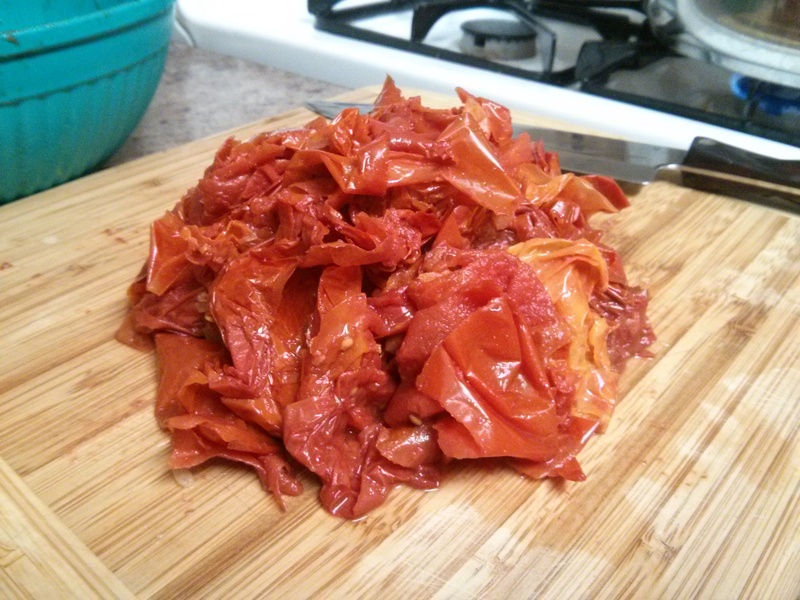 To make the sauce thicker, I also dice the tomato skins into a paste and then add this paste to the pot. I love this step. I usually dice the skins by hand, but this time I used the food processor to save a little time. 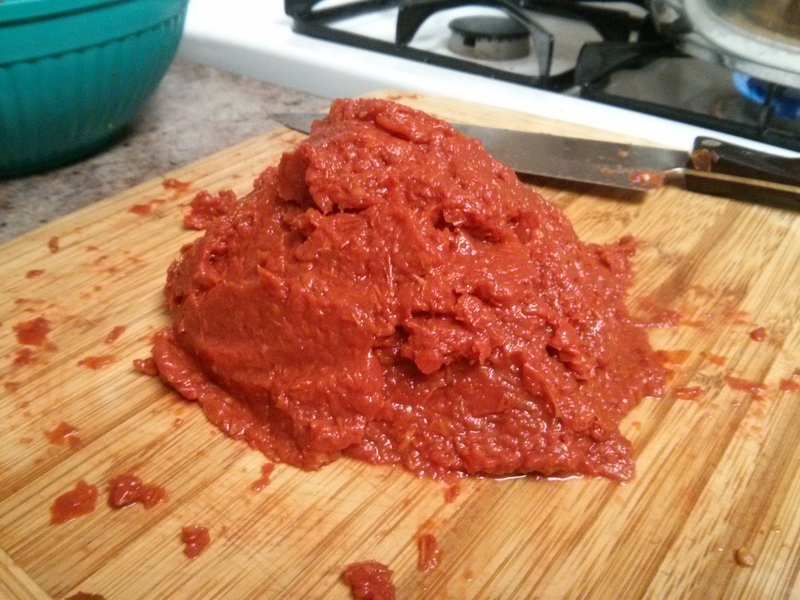 I measured the volume of the resulting paste above, and it was 13 oz. The second to last step is adding salt and pepper. 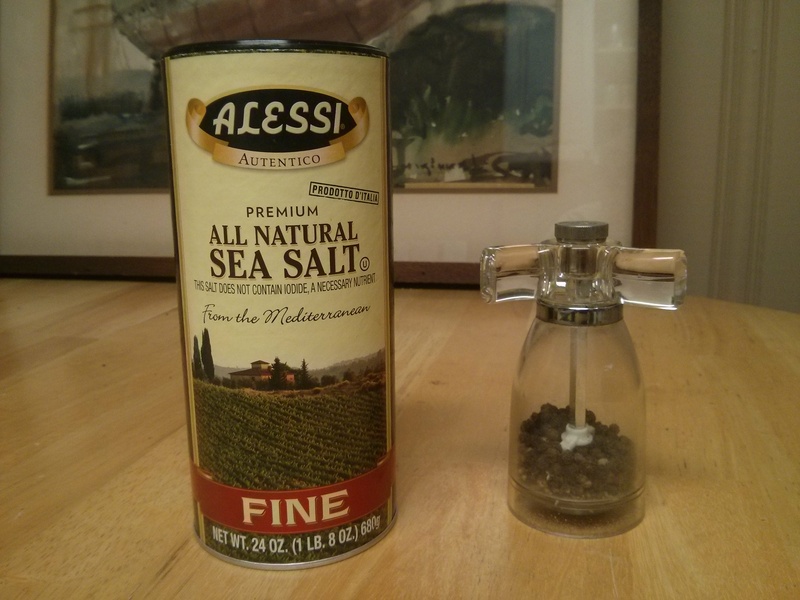 I usually do 2 parts salt to 1 part pepper, but the ratio and exact amounts are up to you. Add a little, see how it tastes, add then add some more if you think it needs more. 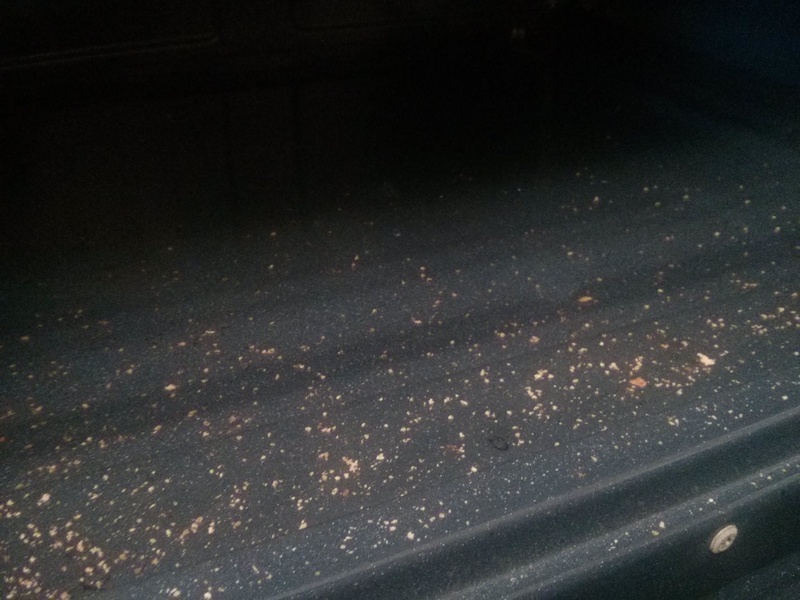 I made a note while I was cooking that I added 1 tbsp salt and 1/2 tbsp pepper, but I think it actually might have been 1.5 tbsp salt and 3/4 tbsp pepper. Either way, it tasted good in the end. I also have a tendency to use less salt than others, so that’s another reason to try things out and see what you like. 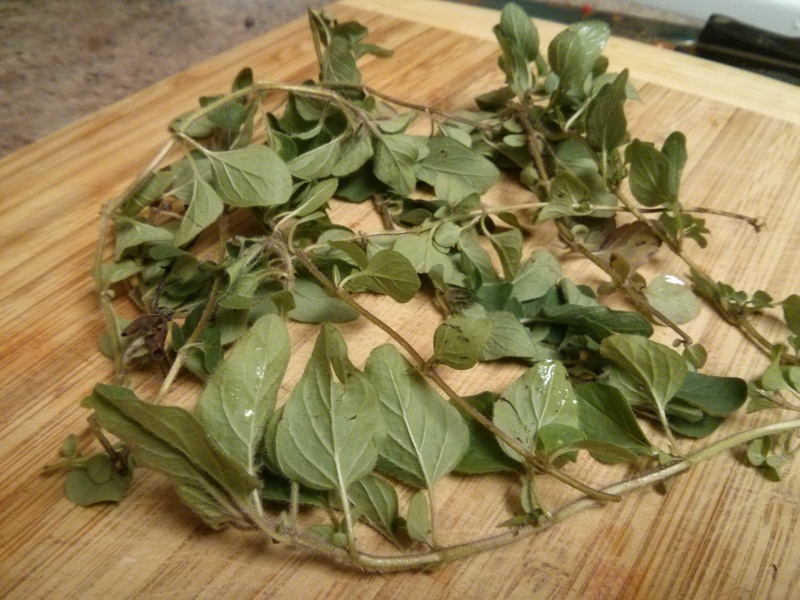 The last step is adding oregano and basil (or any herbs that you like). 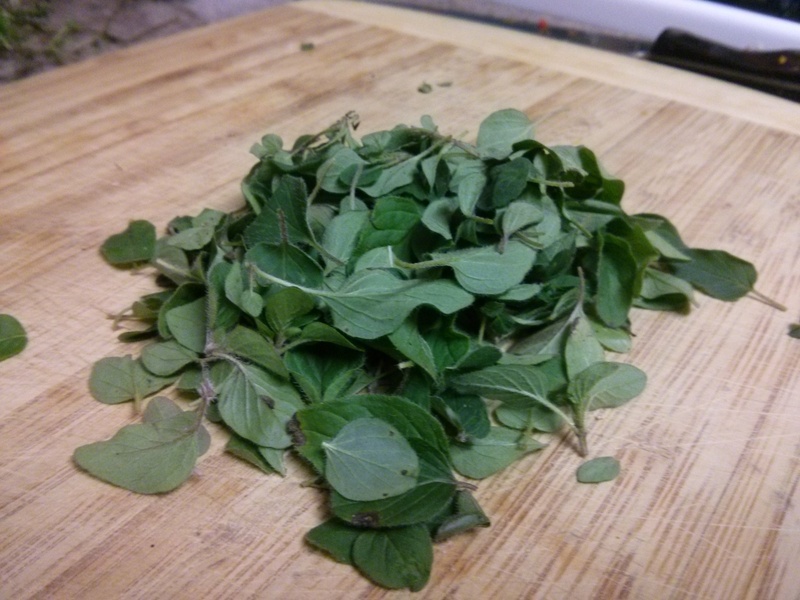 This time I used fresh oregano from my CSA share and fresh basil from my garden. 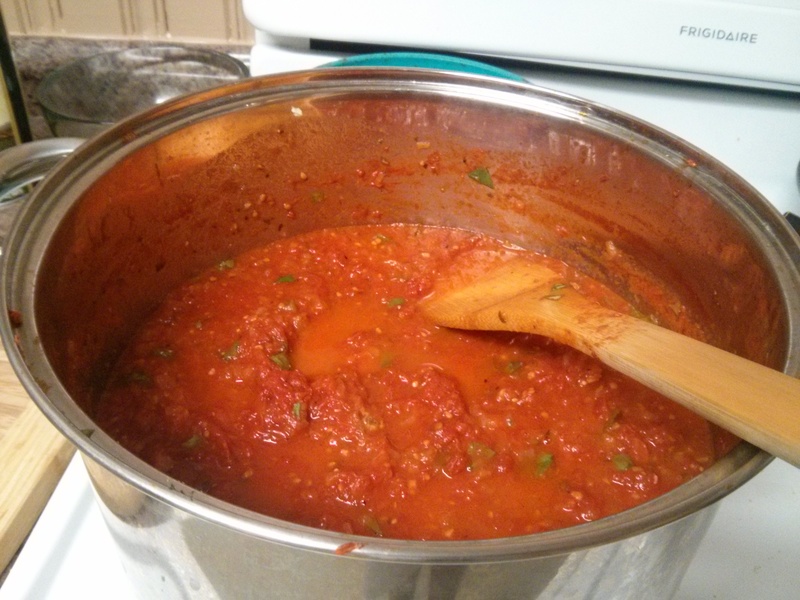 I usually add the oregano during the middle of the sauce simmering/cooking time. 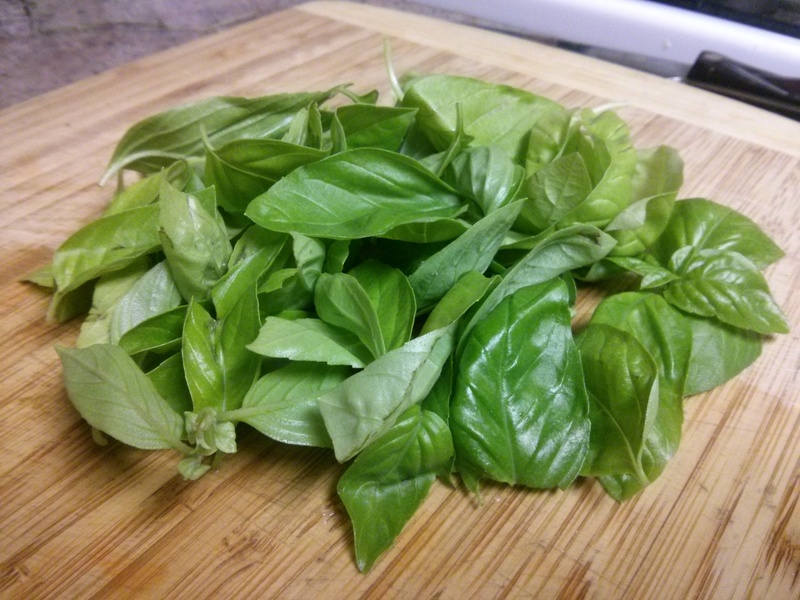 The basil, though, I add just a few minutes before the sauce is done. I think this helps the basil retain its presence in how the tomato sauce tastes. 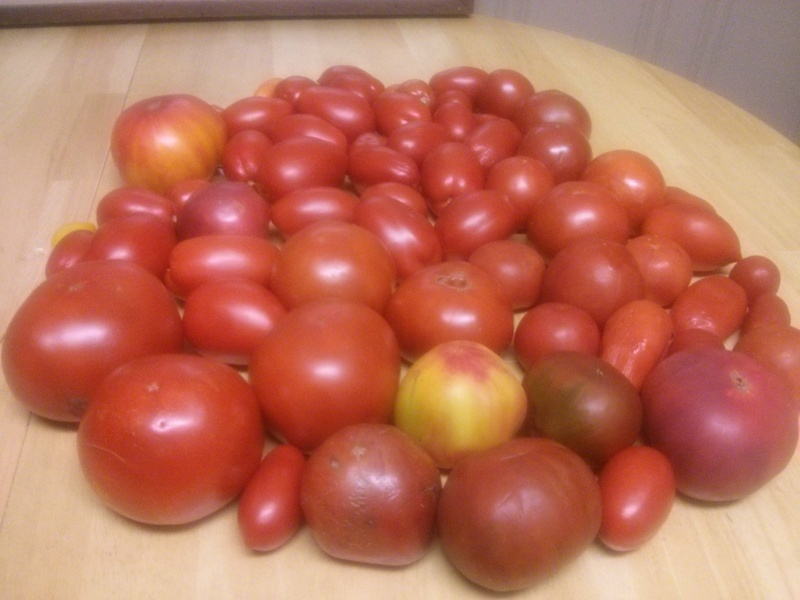 In the end, the approximately 60 tomatoes that I started with helped produce 144 oz of sauce. 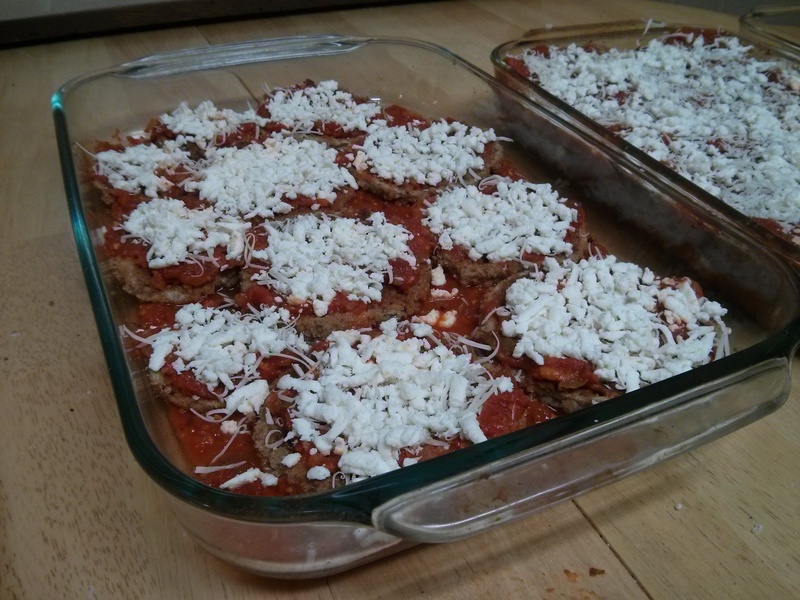 Next up is a look at putting everything together – eggplant, tomato sauce, and cheese: the Eggplant Parmesan. 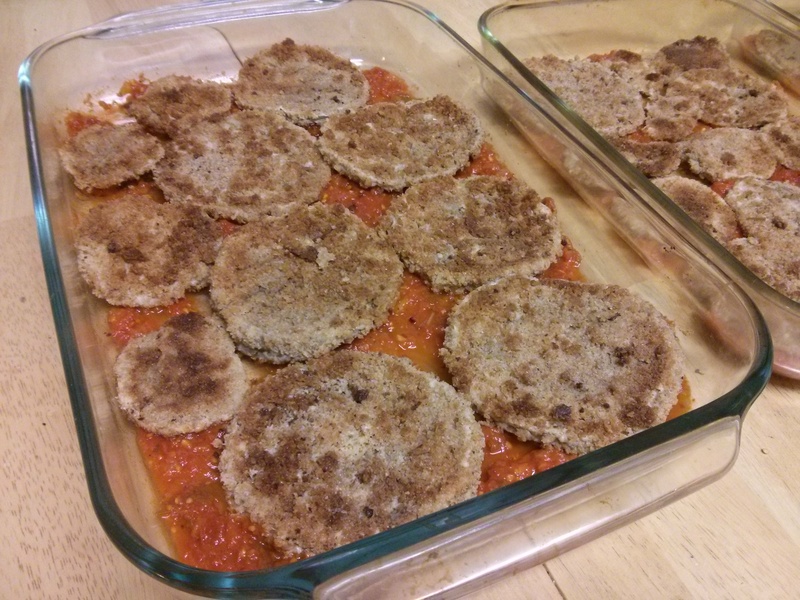 This entry was posted in Uncategorized and tagged basil, eggplant parmesan, food, life, olive oil, oregano, recipe, tomato sauce, tomatoes, vegetarian on October 15, 2014 by dave379. I took a lot of pictures, as usual along the way, but first I’ll do words, with a post called 3a. It started with a line – I got inspired and free – and the rest came as I cooked, plus the plans for 3b. 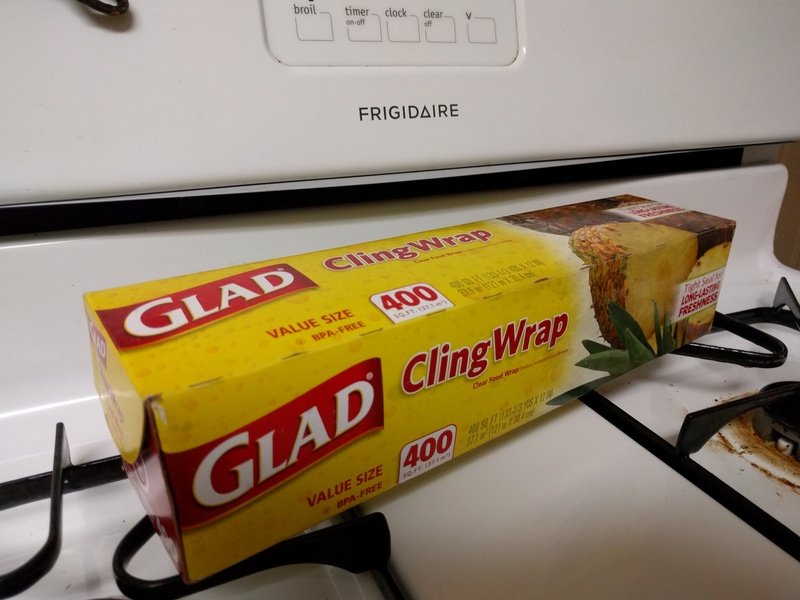 In place of the canned crushed kind. I’ll get all that I need and be on my way. With a knife, cut away. Place the tomatoes to stay. But the soft flesh from the toil. To pass the use test. And sauté till they’re soft, much better. Let it simmer, not quick. That’s how to make the sauce thick. And add this paste to the stew. Not just cooking, life too. One the latter, all square. And we’re done! Let’s make the plates full. Are you hungry like me? I could go for a dish. That’ll be our tomorrow wish. 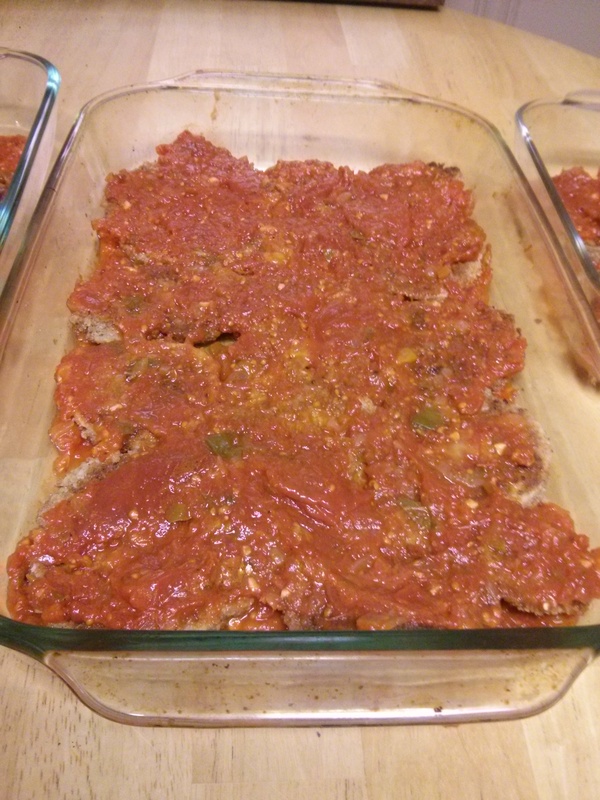 This entry was posted in Uncategorized and tagged eggplant parmesan, food, life, tomato sauce, tomatoes, vegetarian, verse, words on October 10, 2014 by dave379.